- U.S. Gold Corp.is pleased to report the September 7, 2018 BLM (Bureau of Land Management) approval of the Keystone Project Plan of Operations / Reclamation permit for up to 200 acres of surface disturbance. - Drill targets that have been identified almost entirely by surface work consisting of geology, geochemistry and geophysics with a limited number of early stage scout drill holes can now be completely accessed and assessed by drilling. ELKO, Nevada, Sept. 17, 2018 /PRNewswire/ -- U.S. Gold Corp. (NASDAQ: USAU), a gold exploration and development company, reported today that its Plan of Operation (POO) for its 100%-owned Keystone Project on Nevada's Cortez Gold Trend (Battle Mtn-Eureka Trend) has been approved by the U.S. Federal Government's Department of Interior, Bureau of Land Management (BLM). The decision letter is available at: Keystone_Decision. With this approval, U.S. Gold Corp. can now access and drill almost all localities of BLM managed public lands within the 20 square mile Keystone Project area. To date, drilling at Keystone has been limited to existing access and very limited amounts of new disturbance under five Notices of Intent (NOI's) each with a maximum of five acres within the entire Keystone project area of about 20 square miles, or almost 13,000 acres. Almost all prospective targets identified and assessed by surface access means to date have remained inaccessible and unassessed by drilling. 2016-2018 scout-type drill holes comprised of 22 individual holes on 15 total drill sites have importantly added to the knowledge of, and geological understandings of, the permissive lithologies and favorable stratigraphy of the project. Thick sections of permissive, and locally anomalously gold-bearing intervals with strong pathfinder metals have been encountered in several of the scout holes throughout the project area. 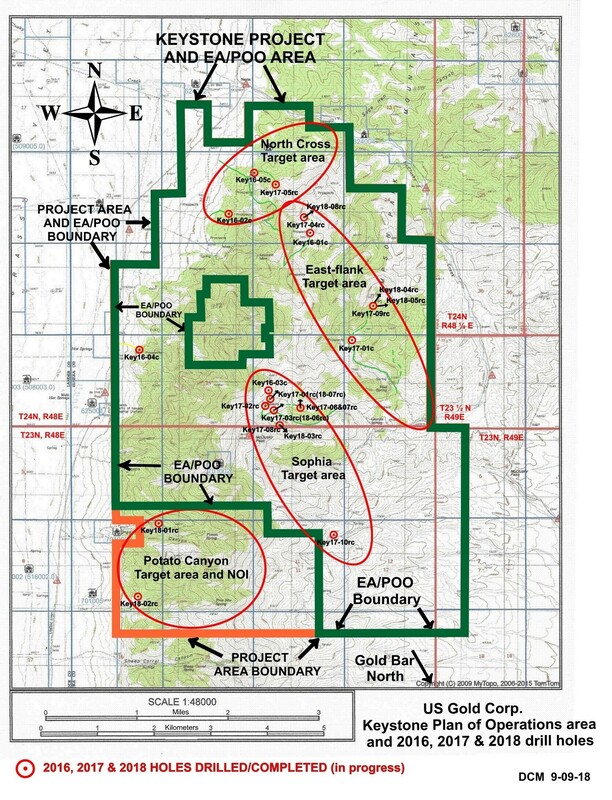 The now approved POO covers approximately 11,000 acres in portions, or all of 23 sections in Townships 23N & 24N, Ranges 48E & 49E, and can be reviewed on U.S. Gold Corp.'s website at the following link: https://www.usgoldcorp.gold/keystone-sept-ea-poo-boundary-map.jpg. Exploration-related disturbance and reclamation bonding can now be conducted in multiple phases of up to 50 acres each up to a total of 200 acres. This approved POO provides access to all of the key targets U.S. Gold Corp. intends to pursue in the next several years. The map linked to this news release identifies target areas anticipated to be drilled as soon as possible in 2018. Specific target localities are currently being assessed for drill site identification and placement. Dave Mathewson, U.S. Gold Corp.'s Vice President of Exploration, states: "We are very pleased to have the Keystone Plan of Operation approved. Now we can place a drill almost anywhere within a large number of any of several target localities. We have worked the last couple years, with the understanding that the targets were mostly out of our reach with a drill. In spite of this inherent exploration limitation, we advanced the program considerably with extensive detailed surface work combined with well-placed, informational core and reverse circulation scout holes. Now that we have the Plan of Operations in place, we intend to pursue target development and assessment with the drill."